The Red-spotted Admiral Butterfly comes in two very different forms. The White Admiral (not pictured) has a wide white band on the top and bottom of its wings, while the Red-spotted Purple (pictured here) is easily identifiable by its iridescent blue color and orange or red-orange spots on the underside of its wings. The butterfly is fairly large with a wingspan of 2.5 - 3.6 inches. 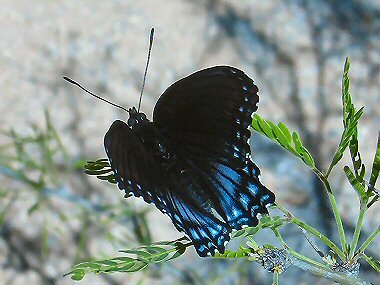 The Red-spotted Admiral Butterfly is a mimic of the Pipevine Swallowtail which predators do not like to eat due to their unpleasant taste. 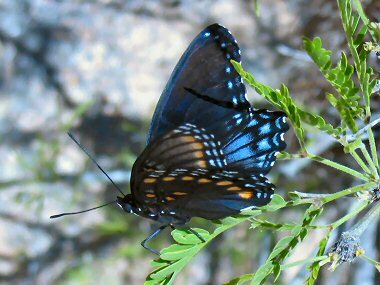 The butterfly can be found throughout much of Arizona except for the extreme western and northeast portions as well as in New Mexico. It typically lives along streams and rivers in oak woodlands and mixed evergreen forests. Adults typically fly from late March through the middle of November and eat sap, rotting fruit, carrion, dung, and occasionally nectar. Host plants for the butterfly include willows, cottonwood, quaking aspen and chokecherry.